VINYL ON VINYL: Jon Burgerman in Vinyl on Vinyl on July 28, 2013! Jon Burgerman in Vinyl on Vinyl on July 28, 2013! 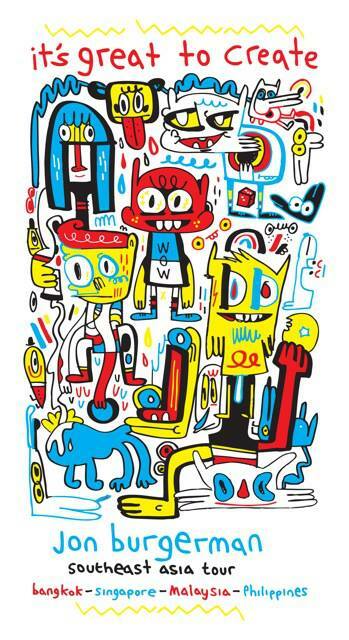 "Jon Burgerman makes vibrant, neo primitive scrawls of shapes and colour. He's pushed his monster-like characters into compositions where cartoon-like forms are crammed on top of each until they create a screaming mass of energy. Intensely prolific, he has pushed the character obsession of the late 90s into a far more interesting and strong direction. Think Walt Disney at an Incan monument on mescaline." Jon Burgerman has risen to be one of the prominent artists who traverse the disciplines of contemporary art, design, illustration and entrepreneurism. His award winning work can be seen globally from gallery and bedroom walls to cinema and iPhone screens. A sense of British self-deprecation, dry humour and modern-day anxiety imbues his work along with an enthusiasm for salad. Burgerman exhibits internationally and his work is collected worldwide and is in the permanent collections of The Victoria and Albert Museum and The Science Museum in London. He has received a Cannes Lions Advertising award, two D&AD Silver award nominations and has collaborated with brands that include: Pepsi, CocaCola, Nike, Sony, Sky, Kidrobot, Puma, Nintendo, MTV, Levis, 55DSL, Miss Sixty, AOL, Size? and Rip Curl. He also once designed a special sick bag for Virgin Atlantic flights. Time : 5 – 8 pm. Time : 7 – 9 pm.